How to tell toddlers about death… and how I failed miserably. – Irama Valdes, P.A. Today I taught my three year old his first lesson about death and was left far more affected than he was. His great aunt passed away a month ago (his “Tutita”) and today, in a moment of shame and vulnerability (he had farted and mistakenly pooped a little in his undies), he said through tears “Extraño a Tutita.” I miss Tutita <- what he calls her, which is based on what I always called her: “Tutia”. Literally translated, TuTia means “Your Aunt”, which were the words my mother would say when she introduced my aunt to me, so I guess this is “Your Aunt” kinda just stuck. I thought I would be stronger when the moment came (I also thought this moment wouldn’t arrive for at least another year). But I broke down when he asked; I also broke down when I began my explanation; and I broke down again when he simply shrugged, said “Okay Mami” after my not-so-thought-out explanation and walked away as if this whole death thing were as normal as taking a bath. 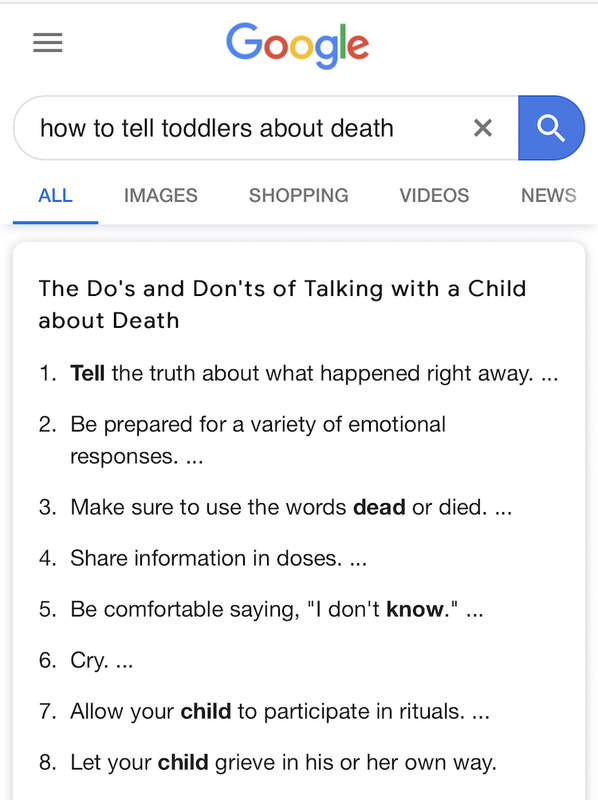 I didn’t even get a chance to research “How To Tell Toddlers About Death” which is the #1 top search topic when you type in “How to tell toddlers…” on Google. (Second place went to telling toddlers about divorce and third place to pet death). Of course, while putting him to sleep tonight I conducted some minor research and on one site they had a list. Thank God Number 6 was “Cry.” Check! My Tutia wasn’t just some estranged aunt. So many Hispanic families are large and have so many siblings and aunts and uncles and cousins. Not my family. We had my grandmother who passed away almost 10 years ago, and then we were left with my aunt, her only son, my mom and me. That’s it. So, after my aunt’s passing, we lost 1/4 of our family, at least of the adult generation. 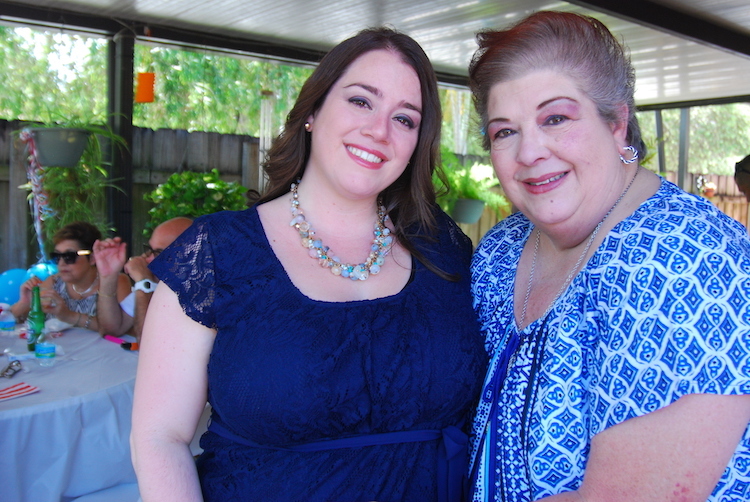 My Tutia helped raise me… she saved my skin and made excuses for me more times than I could count. And she saved EVERYTHING! I can’t begin to describe how many greeting cards, school awards and recognitions, and so many photographs I have gone through this past month. She and I were so much alike in that sense. We both understood the value of money and had professional careers, but memories were, well, are, our most prized possessions. The moments she and I spent together are replayed in my head daily. The moments she spent with my son, her sunshine, will forever live in my mind and in my heart. So, how did I tell my three year old that his Tutita died? I told him Tutita was now with Papá Dios and that we wouldn’t be able to see her anymore. Of course he asked me why and I responded that Papá Dios needed her with him. He reiterated that he missed her. I told him that it was okay to miss her and that when he did miss her and wanted to talk with her, all he had to do was talk to Papá Dios and he would get the message to Tutitia. He shrugged, said okay, went after a monster truck, and left me crying on the bathroom floor. And even though my heart is absolutely broken, I am relieved that he took it so well. He’s so young that soon enough, Tutita being in heaven will be his norm, which is what saddens me the most. He won’t get to grow up with his crazy Tutita guiding him, bothering him, or teaching him about Cuban history or art, like she did with me. But I will make sure we never forget her and pray every night for her because I know she’s listening. We love you always, our Tutita.